The Unknown, Entertaining Mind of Miss Dena Jones: Introducing Digi Galore Challenges! *** If you're looking for the It's A Wildlife Blog hop, please CLICK HERE. Hey, everyone! There is a new challenge blog in blog world called Digi Galore Challenges, and GUESS who is on the Design Team! Yup! ME!!! I love working with digital stamps. Not only do they save on space, but they are also cheaper than rubber stamps; and, you can resize them to fit your project perfectly! Digi Galore Challenges already has a great lineup of sponsors scheduled over the next several months. Challenges will be held fortnightly (every two weeks) with prizes offered by our sponsors. The design team has been split into two. Team A (which I am on) will create projects for the first challenge of the month. Team B will create projects for the second challenge of the month. 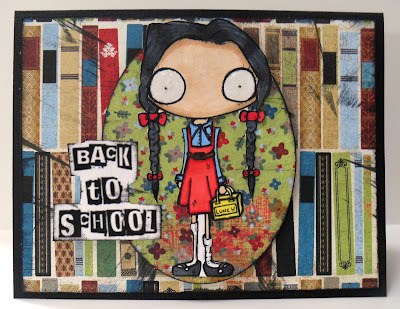 For our first challenge, we are going with a Back To School theme, and all the team members are playing. We could choose any digi we wanted for our kick-off challenge. 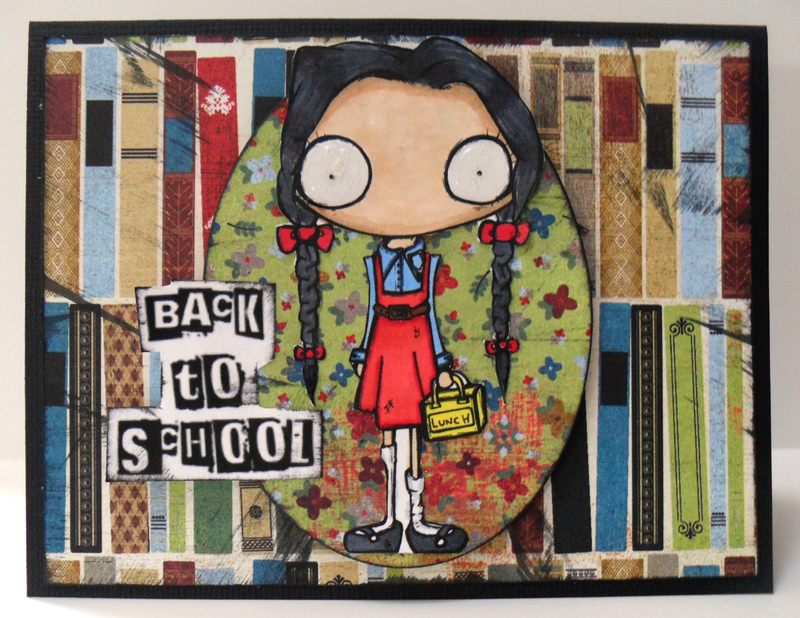 I chose Back To School Girl from The Octopode Factory. I love that she is slightly creepy rather than cutesie. She reminds me of Wednesday from The Addams Family! I inked her up with Copics and then fussycut her. I had the perfect paper to go with this theme: Basic Grey's Oxford Line. I grunged up the paper with some black ink. Then, I used an oval Nestie to cut out a mat for the schoolgirl image. I noticed that there was a splotchy red patch of color in the floral patterned paper, so I cut out the oval to where the red patch of color would be at one end. I thought the little splash of red kinda added to the creepy feel. Also, it matched her dress! The sentiment came with the digi, and I also inked that up before adding it to the card. Now, we don't have a sponsor for this first challenge, but I do hope you'll take a peek at our challenge blog. We also have a Facebook Group. If you'd like to join us on FB, please CLICK HERE. Thanks for stopping by. Have a great weekend! totally love your creation ! Oh my gosh I love her expression, also love your creation with her! !